Minka Aire ceiling fans first made a name for themselves because of their beautiful and intricate stylings, like something that was carefully made over one hundred years ago. Each ceiling fan takes the best of retro stylings without the usual callbacks and cheap recreations. Instead, Minka Aire prides itself in its ability to carefully recreate what made those nostalgic styles so wonderful while still imbuing them with a modern sensibility. The result: ceiling fans that look like they are family heirlooms without the pricing you find at your local antiques dealer. Minka Aire ceiling fans may take their looks from days gone by, but the technology housed inside is the absolute latest available. The lights found inside many of these fans are the latest halogen bulbs, built to shine brighter while consuming far less energy than conventional iridescent bulbs. The motors, spinning lightweight brushed nickel blades, are compact and powerful, built to rotate consistently and remain powerful for years to come. So while the outside looks like something from the past, what’s inside is almost from the future. One of the best examples of this blend of contemporary technology and retro stylings is the Minka Aire Traditional Gyro Belcaro Walnut Fan. 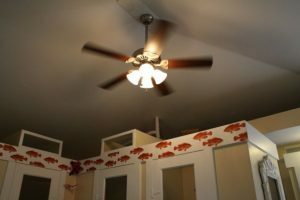 Rather than being a simple ceiling fan with one motorized fan shooting air straight down, this gyro fan features two fans that point more horizontally. The result is a fan that is actually multiple fans, each blowing air to circulate around the room more effectively. This gyro fan also contains intricately detailed retro stylings that are common in all Minka Aire ceiling fans (http://blog.crescentharbor.com/different-types-minka-aire-ceiling-fans/), so it looks absolutely stunning while putting a contemporary twist on the classic ceiling that is fan found in many homes around the world. Probably one of the greatest things about Minka Aire ceiling fans is their longevity. This is possible because of two factors: quality construction and quality materials. Each fan is designed with quality materials, including solid brushed steel and nickel that is built to last, and the construction process itself features rigorous testing to ensure that your new ceiling fan is strong, beautiful, and that it will remain that way for years to come. Minka Aire has made a name for itself thanks to its incredible stylings and quality construction—so much so, in fact, that many decorators cannot get enough of this brand’s fans. If you are looking for quality fans with beautiful retro looks, then look no further than Minka Aire ceiling fans at Crescent Harbor. They have the combination of fashion and function you want at pricing that you will love.